Despite the fact that it is a record wet year with abundant spring snowmelt, early summer conditions in the Delta in 2017 are not looking good. Rapidly falling Delta inflows and a late June heat wave have led to salt water intrusion and extremely warm water temperatures detrimental to salmon and smelt throughout the Delta. Notably, lower Sacramento River flows at Wilkins Slough upstream of the mouth of the Feather River are down about a third compared to the last Wet year, 2011 (Figure 1). Flow is only about 7000 cfs and water temperatures are 73-75°F, well above the water quality standard of 68°F. Winter-run and spring-run adult salmon will not move up the river at these temperatures. Why is flow so low? Good question. Shasta is nearly full but releases are down about a third for a wet year at 8000 cfs. In contrast, the San Joaquin River flow coming into the Delta near Stockton is 13,000-15,000 cfs, with water temperatures of 71-73°F. Feather River flow contributions to the Sacramento River are very low (Figure 2). Yuba and American River flow contributions remain strong at about 4000 cfs each. With sharply falling Delta inflow and outflow, high exports, and the heat wave, the Delta is unusually warm at 72-75°F. Such temperatures are detrimental to juvenile smelt, salmon, and sturgeon survival. Juvenile salmon have been present in the Delta well into June on their seaward migrations (Figure 4). With falling Delta inflow and high exports, the Delta is stagnating and salt water is intruding at the west end at Chipps Island (Figure 5). The Low Salinity Zone with the few Longfin and Delta smelt that are left is moving into the Delta on incoming tides. The water temperature at the head of the LSZ is already 72°F (Figure 6). Higher temperatures would be very detrimental to surviving smelt and seaward-moving juvenile salmon. The further east the LSZ moves, the warmer it usually becomes. There is a consistent late spring pattern in the operation of State Water Project and Central Valley Water Project in which they cut reservoir releases while exporting the remnant freshwater pool in the Delta. Even in this very wet year we are again witnessing this water supply control strategy. The problem is the rivers get too warm even to the point of violating water quality standards. With less water and warmer water entering the Delta, the Delta also becomes too warm. Delta water quality standards and endangered species permits are supposed to keep this from happening. Come July 1, conditions will only get worse, especially as snowmelt declines and San Joaquin flows drop sharply. What can be done? Both Shasta and Oroville reservoir releases are lower than normal. Just keeping their cold-water releases near normal and allowing the flows to pass through the Delta would nearly fix the problem. Exports in the 1970’s and 1980’s were limited to 6000-9000 cfs in June-July of Wet years. Reducing the present export level of 11,000 cfs would also help. These would be very reasonable actions given present water supplies in the Central Valley. Figure 1. Flow in the lower Sacramento River at Wilkins Slough in late spring of 2011 and 2017. Figure 2. Lower Feather River flow at Gridley upstream of the mouth of the Yuba River. Figure 3. Delta outflow in late spring 2011 and 2017. Figure 5. Salinity (EC) at Mallard Island gage near Chipps Island (eastern end of Suisun Bay) in June 2017. Figure 6. Water temperature at Mallard Island gage near Chipps Island (eastern end of Suisun Bay) in June 2017. Sometimes it doesn’t take a lot of water. In a May 29 post, I discussed how a small diversion of cold water from the West Branch of the Feather River sustains the Butte Creek spring-run Chinook salmon, the largest spring-run salmon population in the Central Valley. In a May 8 post, I described how the Shasta River, despite its relatively small size, produces up to half the wild fall-run Chinook salmon of the Klamath River. In both examples, it is not the amount of water, but the quality of the water and the river habitat that matters. In the former case, man brought water to the fish. In the latter, man returned water and habitat to the fish. While both examples are remarkable given the relatively small amount of water involved, the relatively small restoration effort required on the Shasta River and the minimal effect on agricultural water supply make it almost unique. Just take a look at the present late May 2017 hydrology of the Klamath River (Figure 1). There was only 140 cfs flowing in the lower Shasta River. At the same time, there was 25,000 cfs flowing in the lower Klamath, 2000 cfs in the upper Klamath below Irongate Dam, and 2000 cfs in the Scott River. What is different is that most of the Shasta flow is spring fed, some of which is sustained through the summer. Of the roughly 300 cfs base flow in the river in late May 2017, about 200 was from springs (Figure 2). By mid-summer, flow out of the Shasta River into the Klamath will drop to about 50 cfs, with agricultural diversions from the Shasta at about 150 cfs. October through April streamflow is generally sufficient to sustain the fall-run salmon population. Summer flows are no longer sufficient to sustain the once abundant Coho and spring-run Chinook salmon. Figure 1. Lower Klamath River with late May 2017 streamflows in red. Note Shasta River streamflow was only 140 cfs near Yreka, California. Data source: CDEC. Figure 2. Selected Shasta River hydrology in late May 2017. Roughly 150 cfs of the 300 cfs total basin inflow is being diverted for agriculture, with remainder reaching the Klamath River. Red numbers are larger diversions. The “X’s” denote major springs. Big Springs alone provides near 100 cfs. Of the roughly 100 cfs entering Lake Shastina (Dwinnell Reservoir) from Parks Creek and the upper Shasta River and its tributaries, only 16 cfs is released to the lower river below the dam. Red numbers and arrows indicate larger agricultural diversions. Up to 15 cfs is diverted to the upper Shasta River from the north fork of the Sacramento River, west of Mount Shasta. State water right orders, federal salmon biological opinions, and the Sacramento River Basin Plan all recognize these uses and tolerances by setting summer water temperature targets of 56oF for the Red Bluff (river mile 243) reach and 68oF at Wilkins Slough (river mile 125). Further conditions are set upstream as far as Keswick Dam (river mile 300). In this post, I focus on the summer spawning run of fall-run salmon of the Sacramento River. Fall-run make up the vast majority of Sacramento River salmon, as well as the Central Valley salmon population. Better summer conditions in 2017, especially with a record-high water supply, should help produce more salmon and bring about a recovery of the depressed ocean and river fisheries. Maintain water temperature below 60oF in the spawning reach to protect holding adult salmon. Maintain water temperature below 68oF in the migrating corridor to protect migrating adult salmon. The fall-run spawning reach is from Hamilton City upstream to Keswick Dam: river mile 200 to 300 (Figure 1). Spawning winter-run are protected with a 56oF daily-average limit above Balls Ferry (RM 276). With potentially over half the fall-run spawning below Balls Ferry, a 60oF limit is needed down to Hamilton City (RM 200). Historical water temperatures at Red Bluff (RM 243) show that the Basin Plan 56oF target at Red Bluff was rarely achieved, but that the 60oF limit was achieved except in some critically dry years (Figure 2). Allowing for a 2-degree leeway to maintain the 60oF limit downstream 40 miles to Hamilton City, a 58oF limit was not achieved except in some wetter years. Maintaining a 60oF limit at Hamilton City would take flows of 10,000 cfs or more at Red Bluff (Figure 3). The fall-run migration reach to the spawning grounds above Hamilton City (RM 200) is approximately 100 miles above the mouth of the Feather River at Verona. 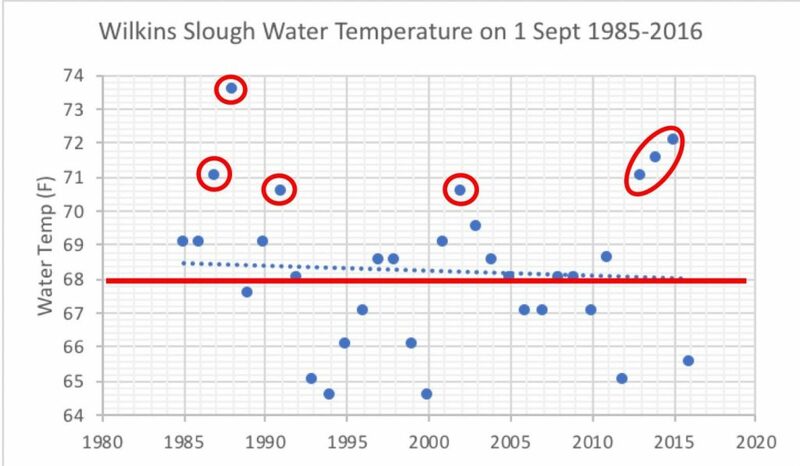 Historical water temperature data from the Wilkins Slough gage (RM 125) show that the 68oF daily average objective was often not met, especially in critically dry years (Figure 4). 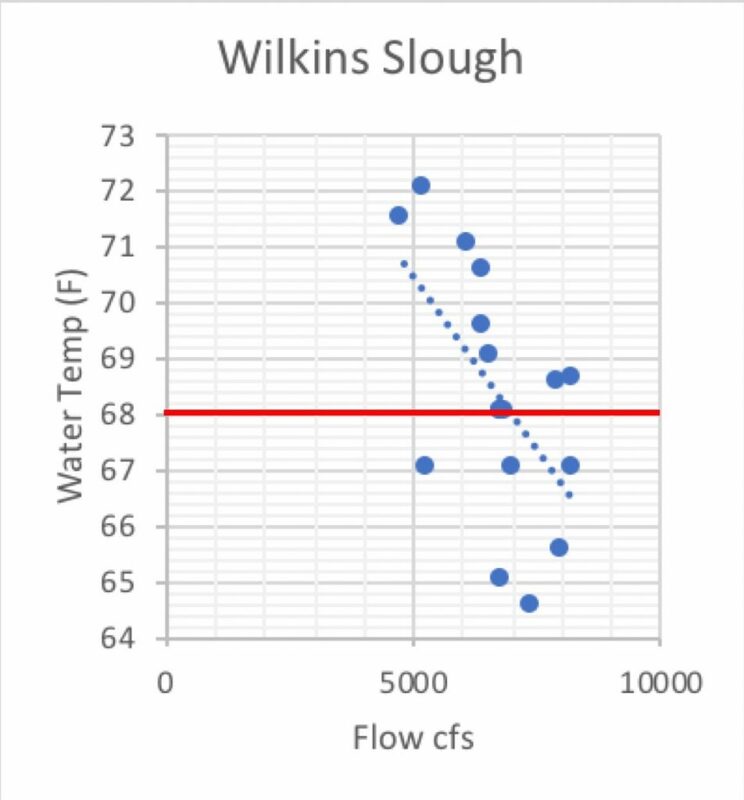 Maintaining a 68oF limit near Wilkins Slough in the lower Sacramento River would take flows of 7,000 cfs or more at the Wilkins Slough gage (Figure 5). Maintaining a 68oF limit at Verona below the mouth of the Feather River would take up to 15,000 cfs at the Verona gage (Figure 6). Maintain summer water temperature at Red Bluff below a daily-average limit of 58oF with flows from 10,000 to 12,000 cfs as necessary, to protect holding pre-spawn and early spawning adult fall-run salmon. Maintain summer water temperature at Wilkins Slough on the lower Sacramento River below a daily-average limit of 68oF with flows from 7000 to 8000 cfs as necessary, to protect migrating adult fall-run salmon. Maintain summer water temperature at Verona on the lower Sacramento River below a daily-average limit of 68oF with flows from 10,000 to 15,000 cfs (including Feather River flows) as necessary, to protect migrating adult fall-run salmon. These recommendations are consistent with Basin Plan objectives for Sacramento River water temperature. Figure 1. Sacramento River salmon spawning reaches: Keswick Dam (rm 300) downstream to Hamiltom City (rm 200). The proportion of the total salmon spawning is shown by five river segments (A-E). Source: CDFW. Figure 2. Daily average water temperature of the Sacramento River at Red Bluff (rm 243) on September 1 2001-2016. Red circles denote critical water years. Red line denotes upper tolerance limit for holding prespawn adult salmon. Yellow line denotes Red Bluff level necessary to meet objective at Hamilton City (rm 200). Green line denotes Basin Plan objective for Red Bluff. Figure 3. Red Bluff daily average water temperature versus flow for September 1 2001-2016. 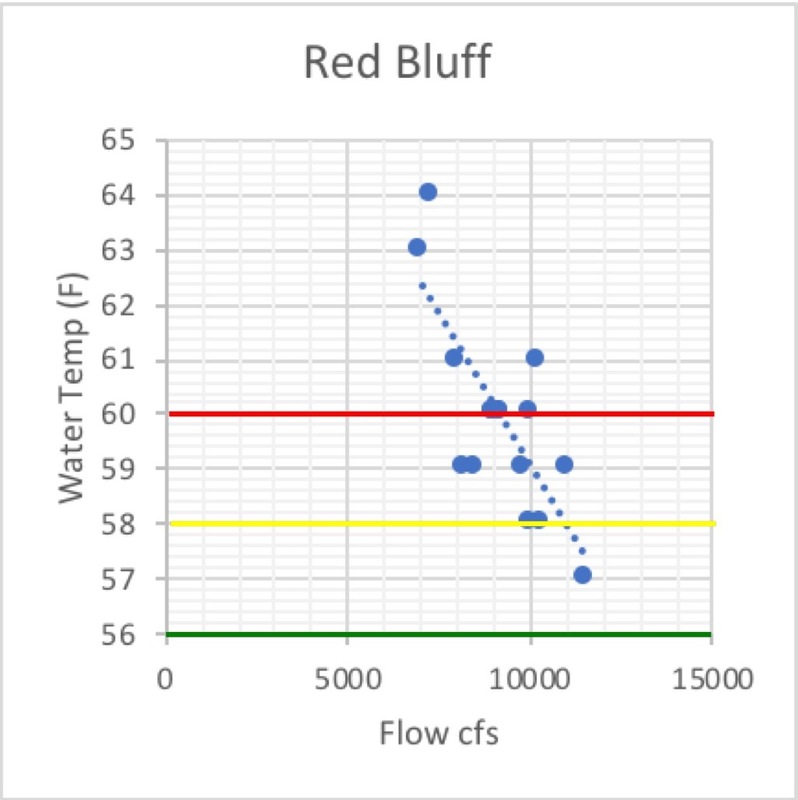 Red line is water temperature limit for Red Bluff. Yellow line denotes Red Bluff level necessary to meet objective at Hamilton City (rm 200). Green line denotes Basin Plan objective for Red Bluff. Figure 4. Daily average water temperature of the Sacramento River at Wilkins Slough (rm 125) on 1 September 1985-2016. Red circles denote critical water years. Red line denotes upper tolerance limit for holding prespawn adult salmon. Figure 5. Daily average water temperature of the Sacramento River at Wilkins Slough (rm 125) on September 1 1985-2016. Red line denotes upper tolerance limit for holding prespawn adult salmon. Figure 6. 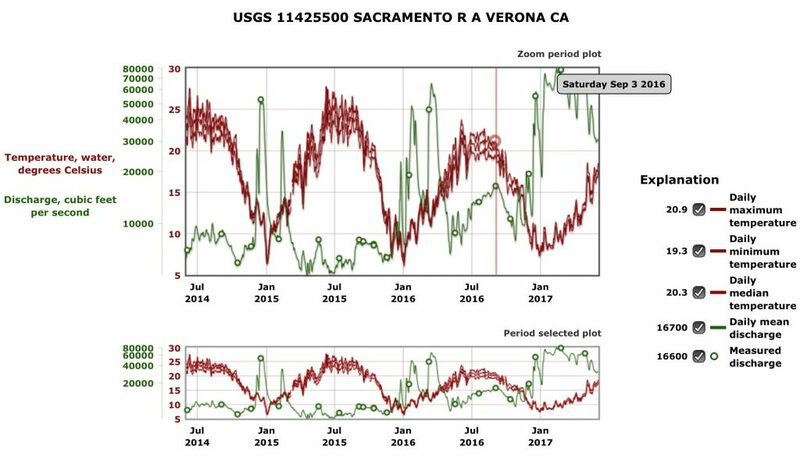 Water temperature (oC) and flow (cfs) of the Sacramento River at Verona (rm 80) from July 2014 to June 2017. Source: USGS. Despite a record water supply in 2017, water operations in the Sacramento Valley are already threatening salmon and sturgeon because water managers are not meeting flow and water temperature targets and regulators are not enforcing them. The water temperature of the Sacramento River at Red Bluff (river mile 240) exceeds the target of 56oF in the Salmon Biological Opinion, water right permits, and Basin Plan (Figure 1a). The water temperature at Red Bluff (Figure 1a) is also approaching the 60oF tolerance limit for salmon and sturgeon eggs and embryos. The water temperature in the lower Sacramento River at Wilkins Slough (river mile 125) exceeds the 65oF tolerance limit for sturgeon larvae and approaches the 68oF Basin Plan tolerance limit for migrating juvenile and adult salmon and sturgeon (Figure 1b). To protect migrating salmon and sturgeon, water managers need to maintain a flow in the lower Sacramento River of at least 10,000 cfs through the summer of this very wet year (Figure 2). Figure 1. 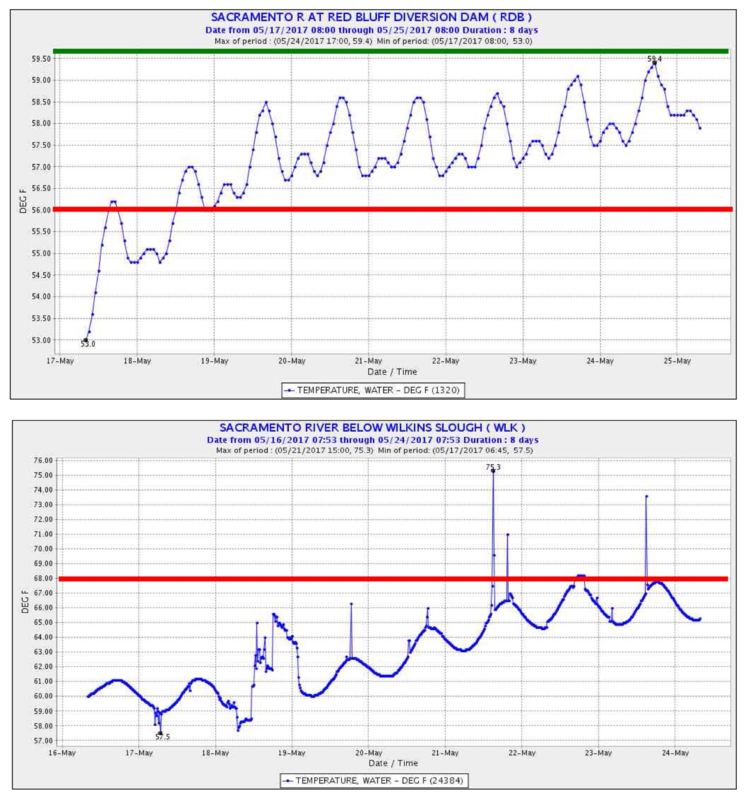 Sacramento River water temperature at (a) Red Bluff (river mile 240) and (b) Wilkins Slough (river mile 125) during May 2017. Red lines depict Basin Plan targets. Source: CDEC. Figure 2. 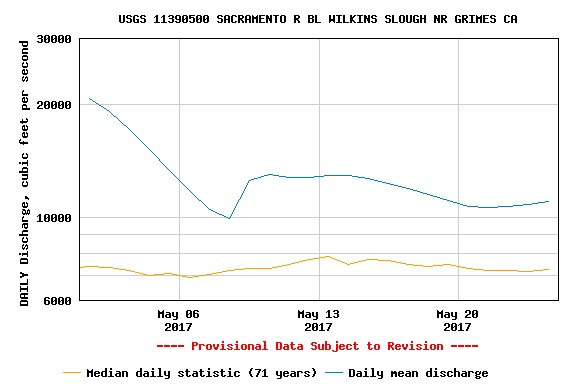 Mean daily river flow in the lower Sacramento River at Wilkins Slough (river mile 125) during May 2017. Source: USGS.